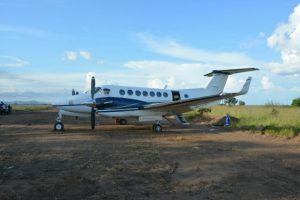 The Beechcraft Kingair aircraft that was found on an illegal airstrip in August, 2017. The United States’ Drug Enforcement Administration is assisting Guyana in intercepting illegal aircraft, Minister of Public Security, Khemraj Ramjattan has told the the National Assembly. Responding to questions by the opposition People’s Progressive Party (PPP), he said three illegal planes that landed in Guyana near the border with Brazil based on information provided by the DEA. “We also have sought an intervention in relation to having better surveillance out of the satellites to see when planes are going to land in our jungle and we have managed, through the assistance, to have at least gotten three planes thus far where they have landed on airstrips and the international cooperation with the DEA is working so when they land, we are noticing,” he said. Ramjattan also said Guyana was also cooperating with the US, Brazil and Suriname to track down and exchange information on cocaine traffickers and money launderers. The DEA has opened an office in Guyana which operates out of the American Embassy in Kingston, Georgetown. Since 2015, three illegal aircraft have been found on illegal airstrips in Guyana but no one has been arrested. No illegal drugs, guns or ammunition have been found aboard any of the planes, but authorities had said that at least one of them had bee fitted with extra fuel tanks for long distance flights. Guyana’s airspace is not monitored by a radar system, but only by civil aviation communication systems for authorised aircraft. Illegal planes land of makeshift airstrips in forest clearings or wide swathes of savanna lands where there are no security personnel. A government-appointed commission of inquiry into the discovery of at least one of the aircraft had revealed that there was collusion among several Indigenous Indian leaders and other villagers.